A digital guide to the collections held at The Bancroft Library relating to Indigenous communities in present-day California. 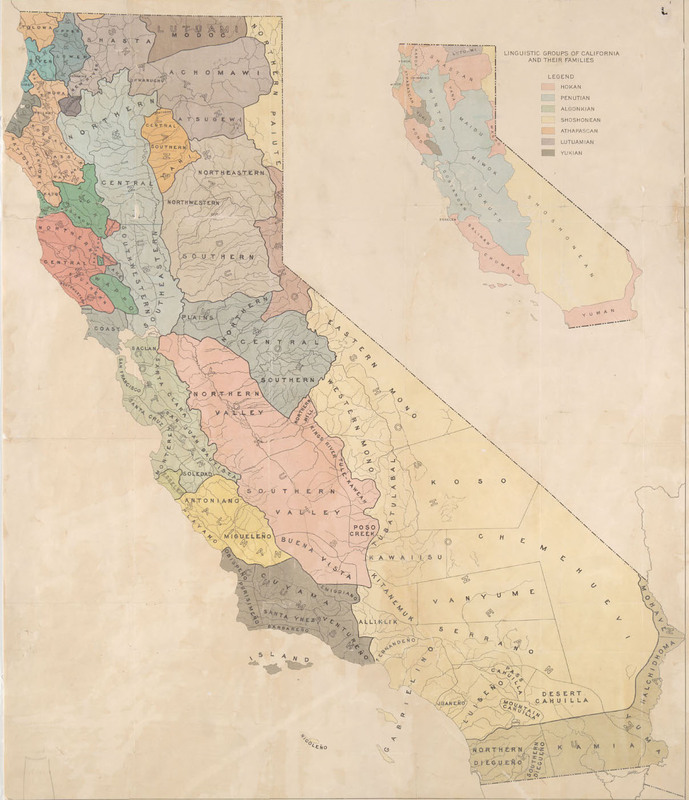 This guide is for archival resources relating to Indigenous communities of present-day California at The Bancroft Library. 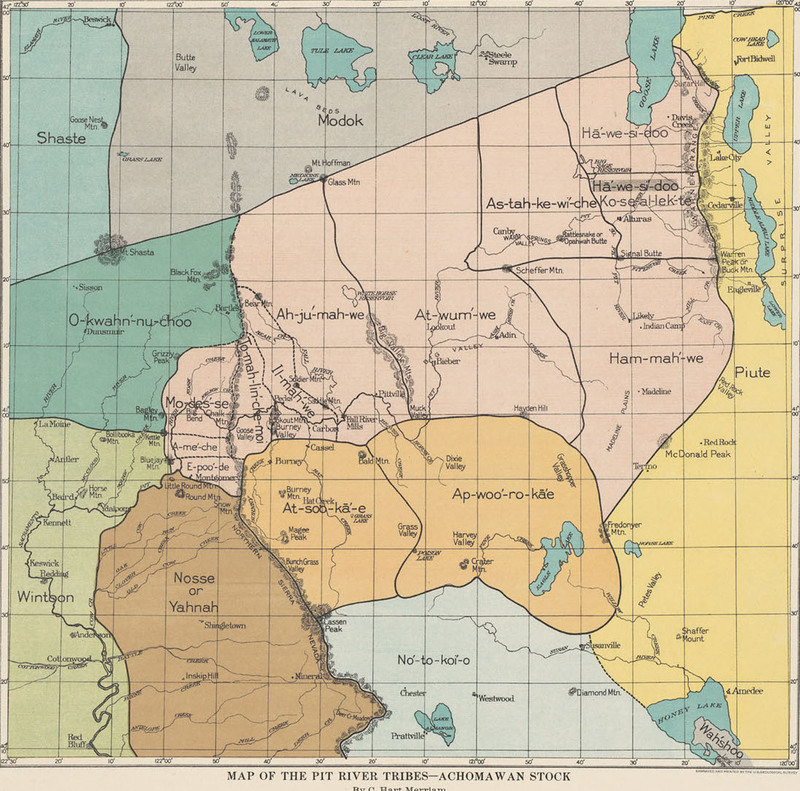 Before contact (the meeting of Indigenous peoples and Europeans), this land was home to many dozens of groups of Native peoples with different languages and ways of life. Many of these tribal communities are alive and thriving today. Over the last 100+ years, The Bancroft Library has collected and received resources relating to these specific communities in the way of written descriptions of language, belief systems, and customs; first person-narratives from Native individuals; descriptions of the treatment and experience of Indigenous people in the Mission system; records from Intertribal Organizations; photographs of tribal communities, artistic, and cultural items; and much more. This guide will provide a more accessible way to locate items related to specific California language families, tribes, and communities, as well as materials to support cultural and linguistic preservation and revitalization. Please note, that while we have organized thousands of resources in this guide, it is not exhaustive and does not include pictorial materials or all secondary sources related to Indigenous communities held at The Bancroft Library. Pictorial materials and additional selected secondary sources will be added at a later date. Users are invited to note any resources that are misidentified or misrepresented in any part of this guide and to notify us directly at bancref@library.berkeley.edu. Before using this guide, please read the "How to Use This Guide" section. Due to time constraints, we could not further organize resources by relationship, which would have been more in line with an Indigenous Knowledge Framework. However, we hope to have a continued conversation on how to improve upon this guide to serve Native communities. Information on Language Families was retrieved from the Survey of California and Other Indian Languages, a research center in the Department of Linguistics at UC Berkeley and the Handbook of North American Indians, published by the Smithsonian Institution. Please note that many of the resources organized in this guide were created many years ago by non-Native individuals and some of the language used is not culturally appropriate or sensitive. These particular descriptions and language used do not reflect the views or beliefs of the creators of this guide. In order to maintain factual content of the items at hand, original descriptions were not changed and were listed in this guide as-is. The following research and writings on Indigenous Knowledge Frameworks and Research Methodologies were referenced during the creation of this guide: Wilson, S. (2008). Research is Ceremony: Indigenous Research Methods. Black Point, N.S. : Fernwood Pub. ; Duarte, M. E., & Belarde-Lewis, M. (2015). Imagining: Creating spaces for Indigenous ontologies. Cataloging & Classification Quarterly, 53(5-6), 677–702. ; Burns, Kathleen, Ann Doyle, Gene Joseph, and Allison Krebs. (2010). “Indigenous Librarianship.” Encyclopedia of Library and Information Sciences, Third Edition. Taylor & Francis. ; Krebs, Allison. (2012). “Native America’s Twenty-First-Century Right to Know.” Archival Science 12 (2): 173–90. ; and The Archivists Circle. (2006). The Protocols for Native American Archival Materials. Northern Arizona University Cline Library: http://www2.nau.edu/libnap-p/protocols.html. This guide was a project created by Crystal Miles and Brian David in partnership with the University of Washington iSchool and The Bancroft Library. If you have questions, comments, concerns, or suggestions, please contact The Bancroft Library at bancref@library.berkeley.edu. Advocates for Indigenous California Language Survival AICLS's mission is to "foster the restoration and revival of indigenous California languages so that they may be retained as a permanent part of the living cultures of Native California." AICLS has programs and events throughout the year that support the needs of a diverse Indigenous community in California, including a Master Apprentice Program, a grant for funding language related work, and the Breath of Life workshop. Northern Arizona University's American Indian Education page contains a wealth of resources and links to organizations, projects and programs, curriculum, articles and reports, and histories and standards on Native education. This site also provides links to language, literacy and reading resources. American Indian Library Association Founded in 1979, the American Indian Library Association was created as an affiliate of the American Library Association (ALA), to address the library-related needs of American Indians and Alaska Natives. They work to develop programs to improve Indian library, cultural, and informational services in school, public, and research libraries on reservations. AILA is also committed to disseminating information about Indian cultures, languages, values, and information needs to the library community. Association for the Study of American Indian Literatures ASAIL is an organization that promotes the study, criticism, and research on the oral traditions and written literatures of Native Americans. ASAIL's site includes relevant bibliographies, teaching resources, and links to ASAIL publications. California Native American Day California Native American Day is celebrated on the fourth Friday of each September. For many years, California tribes have celebrated this day by renewing ties to the earth and keeping their ancestors ways of life alive. In 1968, Governor Ronald Reagan signed a resolution calling for the fourth Friday of each September to be American Indian Day. It was hoped that this acknowledgment would help to inform the general public about Indian heritage and the problems that are confronted by Indians in California. In 1998 the California Legislature passed Assembly Bill No. 1953, establishing the day as an official day of education, celebrating the culture, traditions, and heritage of California Indians. A Guide to Native American Studies Programs in the United States and Canada This guide, edited by Robert M. Nelson, Emeritus Professor of English at the University of Richmond, provides an updated and digital version of the 30-page guide to Native American Studies programs in the U.S., compiled and edited by former ASAIL (the Association for the Study of American Indian Literatures) President Franchot Ballinger, in 1993. This guide provides a comprehensive listing of U.S. and Canadian Native American Studies programs being offered as majors, minors, and certifications at the baccalaureate level or above. National Breath of Life Archival Institute for Indigenous Languages The National Breath of Life workshop is a two-week hands on workshop held in Washington, D.C., that promotes and works to preserve endangered Indigenous languages. This workshop supports the navigation of the Smithsonian Institution and Library of Congress archives and collections for attendees to "locate and acquire documents, interpret writing systems, and transform archival materials into practical lessons for language learning." National Indian Education Association The National Indian Education Association (NIEA) was formed in 1969 by Native educators to encourage a conversation about Native education. The NIEA holds an annual convention providing a space to explore the improvement of schools and the education of Native children, to promote the maintenance and development of Native languages and cultures, and to develop and implement strategies for influencing local, state, and federal policy and policymakers. The Native American Studies Collection, part of the Ethnic Studies Library at UC Berkeley, provides support and resources "to help students and professionals find the useful, meaningful, important, and most objective sources available in the field." This site provides links to resources related to Arts & Literature, California, Education, History, and Language, in addition to several other topic areas relating to Native American peoples and culture. News From Native California A quarterly magazine published by Heyday books in Berkeley, CA. News from Native California is devoted to the "vibrant cultures, art, languages, histories, social justice movements, and stories of California’s diverse Indian peoples." Their website also has a page of resources related to other Indigenous organizations, including Arts & Culture, Education & Language, and Legal resources. Protocols for Native American Archival Materials The "Protocols" is a description of best professional practices for culturally responsive care and use of American Indian archival material held by non-tribal organizations, created by a group of Native and non-Native archivists, librarians, museum curators, historians, and anthropologists who came together at Northern Arizona University in Flagstaff, Arizona. These best practices include the importance of providing contexts for Native American archival materials, working in collaboration and consultation with tribal communities, and the copying, sharing, and repatriation of resources. Sacramento State University Library's Selected Resources on California Native Americans lists a nice set of published works relating to tribal communities of California, as well as a list of California Tribes (listed alphabetically) with bibliographies related to each. Survey of California and Other Indian Languages The Survey of California and Other Indian Languages is a research center, which supports "the documentation, study, and revitalization of the indigenous languages of California and the Americas," in the Department of Linguistics on the University of California, Berkeley, campus. 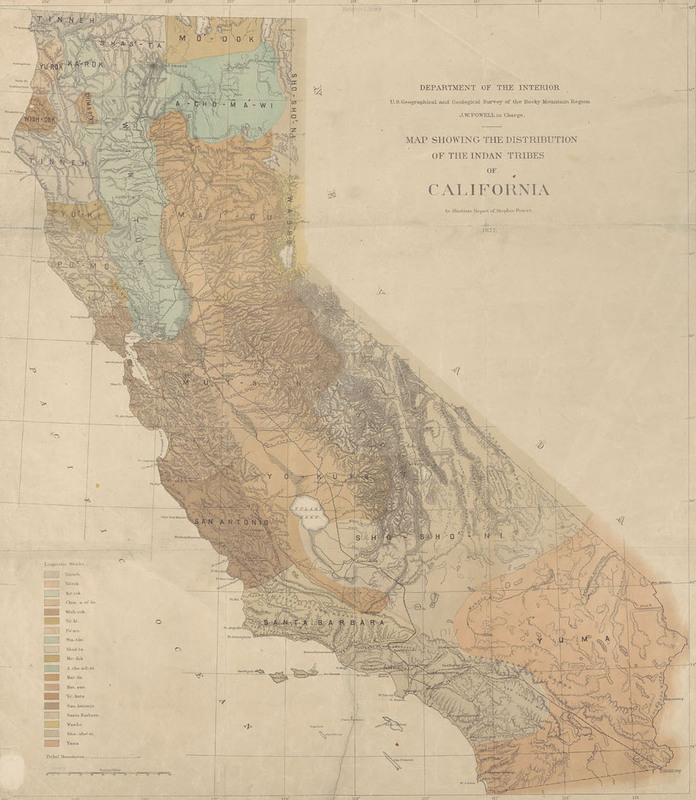 Their website includes an interactive map of languages in California (with resources related to to each language), a guide to their archival collection (including some digitally accessible items), and information on related projects and resources. Map G 04361.E1 1925 .S6 Case C Bancroft, "Indians of California by stocks and tribes." G4361.E1 1877.G4 Case C, "Map showing the distribution of the Indian tribes in California, Map showing the distribution of the Indian tribes in California." G4361.E1 1926 .M4 case XB, "Map of the Pit River tribes--Achomawan stock / By C. Hart Merriam., Map of the Pit River tribes--Achomawan stock / By C. Hart Merriam." 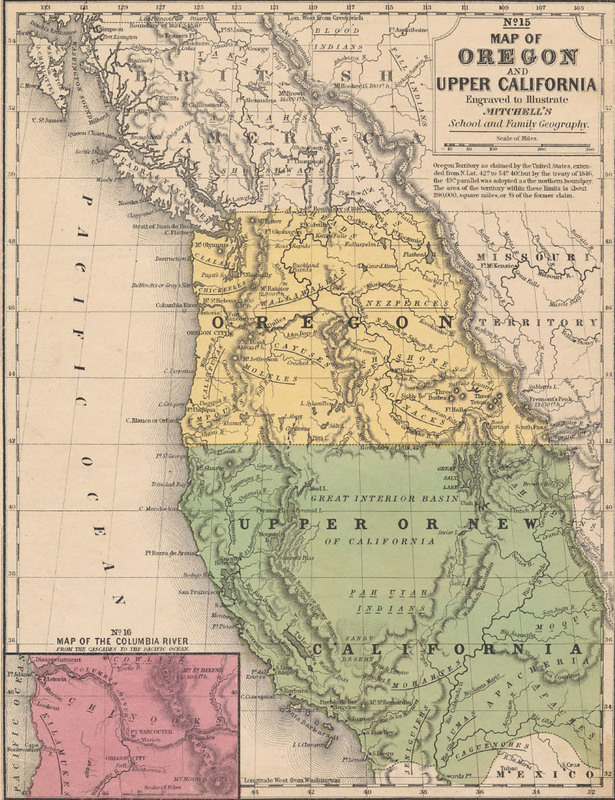 Map 12 1846e A Bancroft, "Map of Oregon and Upper California engraved to illustrate Mitchell's School and Family Geography."